Filtering, timing, coupling, and energy storage are the most common uses for capacitors (not to mention their use in electronic component sculptures). Metallized paper or plastic, plastic film, mica, ceramic, electrolytic, and a few other capacitor types have been around for a long time, with newer formulations of electrolytics providing higher charge storage density, lower leakage, greater stability, lower cost, wider operational temperature ranges, more robust construction, etc. We now have supercapacitors that look as much like storage batteries (and are replacing them in some applications) as they do capacitors. This Popular Electronics article provides a good synopsis of many of these issues. Many electronic projects are assembled with newly purchased capacitors, and many with capacitors already on hand. Sometimes you can get the exact capacitor specified in a project's parts list and sometimes you can't. What do you do when you can't get the called-for capacitor? Do you accept a substitute? Or do you abandon the project? There's no need to abandon a project, and there's no reason to lack confidence in selecting a proper "or equivalent." 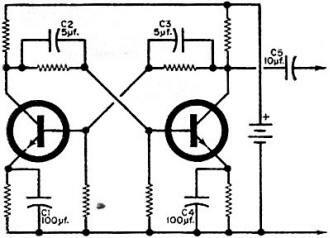 Quite often you can save some money by using a substitute, and in some instances, even come up with an improvement in the circuit. Of course, the closer you can get to the required capacitor's ratings and characteristics, the better. But what ratings and characteristics are significant? 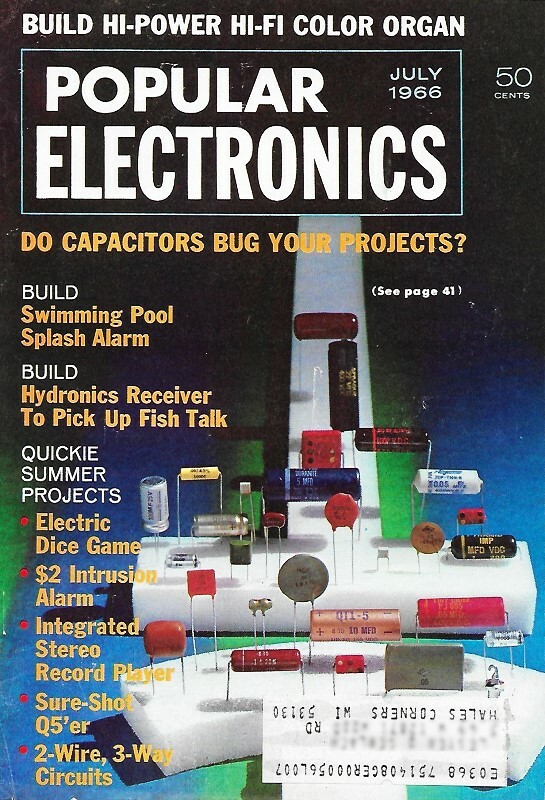 Chances are that you would answer "capacitance and working voltage." While this is essentially correct, it's only a starting point. Physical size of the component and method of mounting are important, especially if chassis and cabinet space is small, or a printed circuit board is used. 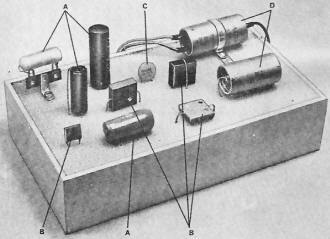 Still other capacitor characteristics should be considered - stability and several different types of losses, and how they are affected by different operating conditions such as: environment (heat, moisture, vibration); circuit applications (bypassing, filtering, coupling, d.c. blocking; timing); and types of circuits (r.f., audio, high voltage). Price is not a characteristic but it may be a factor. However, the knowledgeable experimenter should be able to take all of these things in stride and have no difficulty in selecting a proper capacitor. A few tricks of the trade are revealed here. In most cases it is possible to fit capacitors into a chassis or printed circuit board by laying them flat, standing them on end, or suspending them between two terminals. Most commonly used shapes are tubular (A), rectangular (B), and disc (C). The electrolytics (D) are also tubular in shape, but because of their massive size often require special mountings, such as straps, brackets, sockets, etc. True, you can usually identify the type of capacitor by its appearance, but not all rectangular types are mica, nor are all tubulars paper. Even the experts have to check the specifications. On the other hand, if you are designing a circuit, especially if you want the circuit to lend itself to mass production or easy duplication, you should select a "design-center" value within normal capacitor tolerances to avoid the need of having to tryout a large number of capacitors before you find one that will work in your circuit. While you can use a "cut and try" type of technique to select a capacitor, there's less chance of swapping transistors, resistors, and other components for smoke if you know what you are doing. One or more of four factors - cost, size, loss, and stability - make the choice of a capacitor for a power supply filter entirely different from one for an oscillator circuit. Even if these two types of circuits called for exactly the same capacitance and voltage rating, you would usually select different types of capacitors for each circuit. For example, the power supply filter capacitor can usually afford fairly high losses and its capacitance need not be particularly stable. This is a far cry from the prissy high-Q component required by the tuned circuit of an oscillator, which demands reasonably constant capacitance to keep the os­cillator frequency from wandering all over the spectrum. Briefly, and without getting involved in the chemistry and physics of capacitors, here's a "broad-brush" way to consider what's important. Physical size and price of capacitors are easily discernable factors, and are largely a matter of degree - what may be inexpensive to you may be priced too high for someone else, and what may be too big for one project may fit perfectly into another. However, if a comparison is made on the basis of capacitance or working voltage, a relative indication of price and size can be obtained. It is obvious that capacitor design and materials used should be adequate to withstand both the d.c. potentials as well as the a.c. peak voltages. It's good practice to select a component that can withstand at least one and a half times more voltage than would normally be handled in the circuit. Tantalum electrolytic capacitors are noted for stability, low loss, high capacitance in a small container, and high price. At present, they are used mostly in miniaturized military electronic equipment, but it will only be a short time before more of them will get into consumer channels, perhaps at a lower price. The same circuit applications in different types of circuits call for different types of capacitors. It is not unusual to parallel a 40-μf. electrolytic in a power supply filter with a 0.01-μf. paper tubular or ceramic type. Normally you would expect the big 40-μf. unit to handle everything above 60 cycles with ease, especially the higher frequencies. It doesn't quite work out that way for the big electrolytics. The small unit is in­stalled to bypass any high frequencies that can't get by the electrolytic. Even the same capacitor may act differently depending on how it is installed. Lead length and lead dress can be critical factors in high-frequency circuits. It's a good practice to keep lead lengths as short as possible. Filtering. As opposed to coupling, filtering is essentially a bypassing function to remove all or part of an a.c. component and put it where it will not adversely affect a circuit. 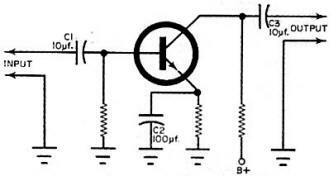 This action is used to smooth out the ripple voltage in a power supply rectifier circuit, as well as to put various tube and transistor elements at a.c. ground potentials without disturbing d.c. voltages. Since the purpose here is to get rid of as much of the a.c. component as possible, larger capacitance values are desirable. If capacitance is too small, the lower frequencies may not be bypassed. However, there may be times when it is desired to bypass only a portion of the a.c. component without materially affecting another portion. All there is to a capacitor is essentially two pieces of metal separated by an insulator, but many different materials are used, and there are many different ways to make capacitors. 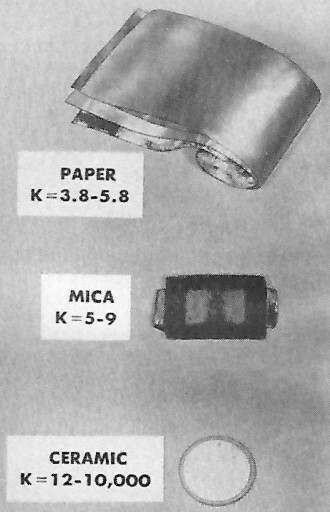 Shown here are: impregnated paper between and on top of two pieces of foil in the process of being rolled into a tubular shape (top); foil separated by a thin sheet of mica (center): and a ceramic disc with deposited silver on both sides (bottom). A capacitor's characteristics and stability depend, to a great extent, upon the dielectric constant (K). and when specified in a parts list should not be compromised by the selection of a different value. Coupling. Instead of bypassing the a.c. component to ground as in a filter, coupling is simply a process of passing the a.c. component (signal) from one point to another. Here again, the larger the capacitance, the easier it is to pass the lower frequencies. If money and space are limited, there are certain practical limits that can be taken advantage of. In most coupling functions a certain amount of voltage divider type of action takes place between the capacitor and other circuit components. If the coupling capacitor has a relatively low impedance as compared to the resistors, coils, tubes, or transistors in the immediate vicinity of the capacitor, the capacitance will appear to be large enough to handle the low frequencies. (The larger the capacitance, the lower the impedance.) 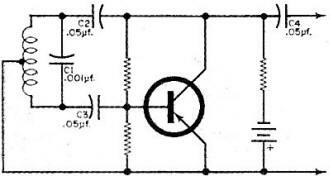 In high-impedance tube circuits, a 0.01-μf. capacitor will work just as well as a 10-μf. 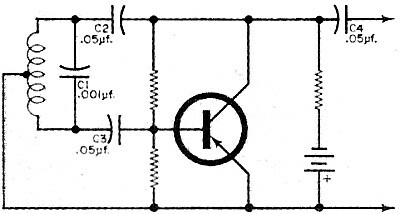 capacitor in a low­impedance transistor circuit. Regardless of the type of circuit, if B+ is present on one side of the capacitor and bias voltage is present on the other side, the capacitor must serve as a d.c. blocking device to prevent confusion of d.c. voltages. Timing. Oscillators, tuned circuits, and other timing networks usually require an exact amount of capacitance and high stability. Temperature coefficient (TC) - the rate of change of capacitance with temperature - should be low, or controlled. Most tuned circuits require a low-loss type of capacitor. Energy Storage. This covers a multitude of applications ranging from a.c. pulse circuits to battery-powered flash bulbs. Most TV sync circuits use energy stored in a capacitor to trigger the vertical sweep oscillator. How often have you seen the picture start to roll after a set warms up? You could use a fan, but it is more practical to obtain a temperature-stable component. Capacitors used in this type of function must have little leakage and must be able to retain the potentials developed across them long enough to work related circuits. 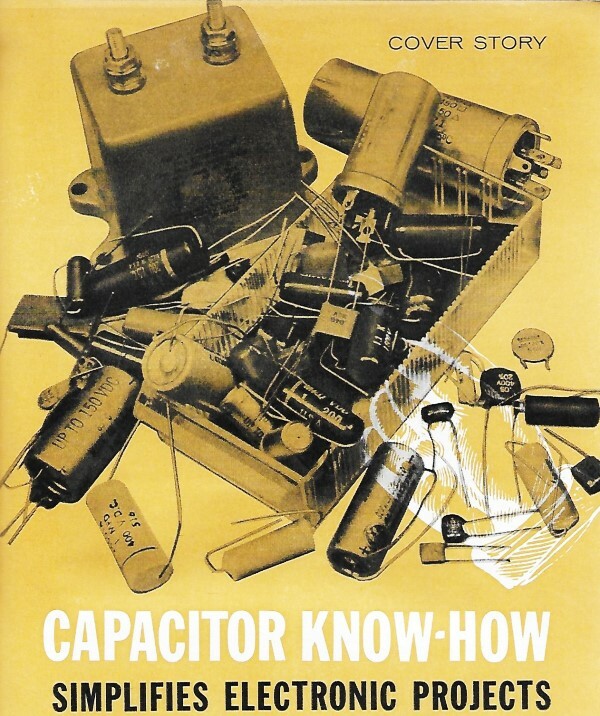 With the advent of the space age and the growing body of knowledge about new materials, the number of different types of capacitors has mushroomed like weeds. It used to take a lifetime to learn all about resistors, but with capacitors it conceivably will take a little longer. Impregnated Paper. Two pieces of foil are rolled between and separated by double sheets of paper impregnated with wax or oil. Characteristics depend upon the impregnating material and size of the foil. This type of capacitor is inexpensive and small, and is usually tubular in shape. It has high insulation resistance, fair stability, and moderate losses-losses increase with temperature and frequency. Voltage rating decreases at high operating temperatures. Impregnated paper capacitors can be used as filters and couplers in most circuits. Capacitance range is 0.001μf. to 20 μf., with voltage ratings up to several kilovolts. Impregnated Paper/Plastic Film. Generally available and similar to the impregnated paper type, except that one layer of paper is replaced by a layer of plastic film to improve insulation resistance and increase temperature operating range, this type of capacitor has a longer life, slightly higher cost, and is similar in size, ratings and applications to its paper mate. Metallized Paper or Plastic. To reduce physical size, a metallic film is deposited on opposite sides of impregnated paper or plastic film and rolled up. Usually, only one layer of dielectric is used. Coupling capacitors C1 and C3 in a transistorized audio amplifier generally require higher values than their counterparts in a tube circuit. Bypass capacitor C2 is not critical, but must be very high in value to prevent low-frequency degeneration. The main reason for the higher values is that transistors have a lower impedance. Value of C1 is critical here - both capacitor and coil determine the frequency of this Hartley oscillator. Capacitors C2 and C3 merely serve as d.c. blockers and should be high enough to offer very little impedance at the operating frequency. As with most coupling capacitors, C4 blocks d.c. and should be large enough to easily pass the signal. This type of capacitor has a self-healing characteristic: an arc at a defect in the dielectric simply evaporates the metallic film until there is no place for the arc to continue. Small size is the chief selling point. Metallized capacitors have lower insulation resistance, higher losses, tend to be less stable, and cost more than the other impregnated paper types. Should they arc internally, they will be too noisy and unsuitable for coupling noise-sensitive circuits. Available from 0.01 μf. to 20 μf., up to 600 volts, they are best restricted to filtering and bypassing functions in tight places. Plastic Film. Plastic film is used here instead of impregnated paper. Insulation resistance is extremely high, losses are low and nearly independent of frequency, stability is excellent. These capacitors are larger and more expensive than the paper types, and may not be usable at high temperatures. Available from 0.001 μf. to 1 μf., with voltage ratings up to 2000 volts, they can be used in most circuits. Mica. An old-timer, mica has superior insulating qualities and can be used in very thin sheets. Either separate layers of foil or thin metallic films deposited directly on both sides of the mica are used as plates. This type of capacitor is usually sealed in a plastic case, and has excellent high frequency, low loss, excellent stability, and high voltage ratings. Mica capacitors can be manufactured with great precision, but capacitance changes with temperature and large values are expensive. They range from 5 pf. to 0.1 μf. with voltage ratings up to 2500 volts. (Special types are available with much higher ratings.) No restrictions on use. Ceramic. A metallic coating is deposited on opposite sides of a ceramic disc or tube. The dielectric constant (K) of the ceramic material determines most of the capacitor's characteristics. Low-K capacitors have low loss, high stability, and excellent high frequency performance. An outstanding characteristic is controlled capacitance change with temperature; this change can be made zero or some known value to compensate for temperature-caused changes in value of other components. Low-K capacitors are fairly small and inexpensive. Capacitance is limited to about 1000 pf. No limitations on use. Medium-K ceramic types provide higher values of capacitance and have fair stability (about 20%). Large capacitance changes can occur outside the rated operating temperature range. High-voltage types having moderate losses are available and insulation resistance is high. Medium-K capacitors are small and low priced. Ratings range from 1.5 pf. to 0.15 μf., up to 5000 volts. Use should be restricted to filtering and coupling. High-K ceramic capacitors pack a lot of capacitance into a small package. Insulation resistance is good, and they are inexpensive. However, losses are fairly high, and capacitance is unstable and can change value readily. Capacitance range is 0.001 μf. to 0.1 μf., up to 1000 volts. High-K capacitors are usually rated in terms of guaranteed minimum capacitance and are very useful for filtering, bypassing, and decoupling. Electrolytics. Electrolytic capacitors did much to further the use of single-phase motors and a.c. power supplies for electronic circuits. In transistor circuits they have assumed renewed importance. They are famous for packing the most capacitance into the smallest volume of space. Large capacitors (C2, C3) are needed to smooth out ripple voltage from rectifiers - values ranging from 20 μf. and up are typical. Electrolytic type capacitors, because of their relatively small size and low cost per microfarad are used here. Capacitor C1 is not always used, but it does reduce r.f. and other hash on the power line; its value, not critical, is usually Quite small. Oscillator, timing, and other tuned circuits, whose frequency of operation depend on controlled circuit values, call for stable low-loss units. In this regard, C2 and C3 are critical, whereas C1, C4, and C5 can vary considerably. Except for polarized types such as electrolytics, polarity is not a factor. These units are made by "forming" an exceedingly thin oxide layer on a metal plate and immersing it in a conducting electrolyte solution. The forming process is a very interesting and easy one to understand. Because it plays such an important part in actual use, and because it more or less takes place every time you flip a switch, its "chemistry" is presented here briefly. It is a process similar to electroplating. A metal plate, most often aluminum, is immersed in a chemically related solution, and connected to one side of a d.c. power source. The other side of the power supply is connected to the solution (electrolyte). As current flows, an incredibly tough oxide film is plated (formed) onto the metal. Since the oxide is an excellent insulator, it virtually stops both the flow of current and further plating action when the coating becomes thick enough to withstand the applied voltage. The higher the applied voltage, the longer the plating action and the thicker the oxide coating. One precaution should be observed when forming a capacitor either for the first time or after it has been out of service for a long time. Until the capacitor is properly formed, it will draw a relatively large amount of current - the higher the applied voltage and the less formed the capacitor, the higher the current flow. High current usually causes high heat and possible destruction of the capacitor. An easy way to control the situation is apply a small amount of voltage at the start of the forming process and gradually increase it to the desired rating. Some capacitors will form quicker than others - you can monitor both temperature and current while judiciously increasing the voltage. Understanding the forming action is also important if you use electrolytic capacitors in solid-state circuits, or in circuits that remain off for months at a time. The oxide film is not perfectly inert. When it remains in contact with the capacitor's electrolyte for long periods of time, with no current flow, it slowly dissolves. This decreases the thickness of the oxide coating and, correspondingly, its voltage rating. Therefore, a 15-volt electrolytic that has been stored for a few months may really be the equivalent of a 10-volt unit. 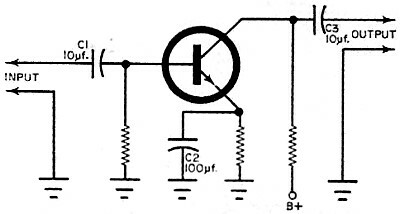 If an electrolytic is connected in a circuit (for instance, as a coupling capacitor between the collector of one transistor and the base of another) with 15 volts across the capacitor, substantial current can flow, sometimes enough to destroy the transistor. In fact, if the same 15-volt electrolytic is used in a circuit with only 10 volts across it, it eventually becomes a 10-volt capacitor. The "extra" oxide is dissolved into the electrolyte. Small size and low price are the main advantages of this type of capacitor. Disadvantages are high losses, great instability, and limited shelf life. Electrolytics are available from 0.5 to 150,000 μf. up to about 500 volts. There are some units marketed with 700-volt ratings. They are best suited for filtering and brute-force energy storage. When properly used, they can serve as coupling capacitors. The disadvantages of electrolytic capacitors have been overcome by the prince of the breed, the tantalum electrolytic. At restricted voltages and temperatures, this type of electrolytic is nearly as good as an impregnated paper capacitor. However, it commands a princely price for these favors. Other Types. There are many other capacitor types. Their variations and combinations usually result from the need to perform in highly specialized sophisticated circuits in environments other than one in which man can live and breathe. There are oil, vacuum, glass, and air types, just to name a few. Just as ceramic has achieved broad use in the past few years, it is quite reasonable to expect that newer materials will exhibit still more desirable characteristics. Actually, hopefully, this may simplify the problem of capacitor selection rather than complicate it. Someday we may have an ideal capacitor, small and inexpensive like an electrolytic, but with the low losses and high stability of the low-K ceramic type. It could make the rolls of foil and paper as rare as the Leyden jar.